What is this resource about? This resource contains information about developing a syllabus and an Example of a syllabus highlighting UDL considerations. Often the syllabus gives students a first impression about what to expect from the upcoming learning environment. The syllabus is an opportunity for each instructor to set the class climate, identify specific learning expectations, and discuss options and accessibility. Provide multiple means of engagement: Outline the learning goals and objectives, the relevance of the content, and any opportunities for choice within the course. Provide multiple means of action and expression: Use the syllabus to communicate regular routines to establish expectations, outline the timing and format of assessments, and offer resources for the management of information. Provide multiple means of representation: Be explicit about the ways in which students can access content (e.g., textbook, slides, course website, videos) where to find background information and multiple examples. A syllabus designed based on the principles of Universal Design for Learning (UDL) has the potential to provide additional access and participation in a postsecondary course. This type of syllabus provides a variety of options for how information will be presented for the course, how students will be assessed, and ways to participate in the course as well as explicit expectations and available supports. Universal Design for Learning (UDL) works most efficiently in the design stage of learning environments. The construction of a course syllabus is an ideal opportunity to support UDL design and delivery elements for all incoming learners, demonstrating that there are multiple paths for learning and achievement within the course. Instructors can use the syllabus, therefore, as a powerful way to communicate or model how they will implement UDL principles and guidelines in the classroom. At the most fundamental level, the syllabus document itself should be accessible. The following tables include several major elements of a syllabus and corresponding UDL considerations. Each element is presented in a side-by-side format. The first column shows UDL considerations; the second column is an example based on a college-level mathematics class. In addition to a syllabus, you might want to consider including a separate learning guide for each week or unit. This guide would outline the specific learning objectives for that week and how they relate to the assignments, specific due dates, and a detailed calendar. For more ideas about a UDL syllabus, visit the syllabus rubric from EnACT's UDL-U site. Engage students by making this first introduction personal. Include a photo and a video to introduce yourself, the course, and your expectations (see video below). If teaching online, add a video “tour” of critical features in the course including supports, communication, and progress monitoring. Add several options for communication, including social media that you may use professionally. MICHELLE BENSON-YOUNG: Welcome to Algebra 114, I am Michelle Benson-Young, your class instructor. This is a short video, just a few minutes long, to go over what class is going to be like and to get to know me a little bit better. My office hours are Tuesdays and Thursdays from 11:00 to 12:30. That’s my email address and my phone number. Feel free to call and/or email, and leave messages any time. I’m also on Twitter and Skype. And I’m very excited to be the instructor of this class and to meet all of you. MICHELLE BENSON-YOUNG: For student resources, I just wanted you to know that this is the building that my office is in, and it’s the same one as the tutoring lab, Pearson Room 33. So, in addition to what you’ll get during class time, you will be able to use the student lab. I’m going to have a student study guide available and we’ll go over that in class, as well as my office hours. I want to make sure that we can accompany all learning styles and accommodations in this class so, the more you know your own learning styles and can communicate that with me, I think the more successful you’re going to be, and I would like every one of you to be very successful. MICHELLE BENSON-YOUNG: The goal of this course is to give you the algebraic foundation necessary to continue on in mathematics courses. So we’ll be going over things like algebraic notation, properties of equations, problem solving techniques, and algebraic vocabulary. MICHELLE BENSON-YOUNG: Our course objectives, is first off to do well in this course. And then again we also want you to understand algebra techniques and properties, families and functions, mathematical notation and vocabulary, as well as and what I think is the most important, is reflective thinking. And these will all be connected to the daily assignments. MICHELLE BENSON-YOUNG: So the materials in class, first off is the textbook and that’s available at the store, the student store. An accessible format of this text, it does exist, can be accessed through the office of disabilities. We will have a course web site and that’s going to have a lot of additional information as well as more videos of me explaining things in depth or in a different way than I may have done in class. We will have slide presentations. I will also upload those onto the course web site. There will be related web sites, that I think are going to be very helpful, and hopefully you will be able to show us and share with the class related websites that you’ve found to be helpful in understanding the material. And that’s part of the student contribution, as well as your thinking. MICHELLE BENSON-YOUNG: The assignments and assessments, always the, you know, most stressful part! So the assignments…[mumbling to self] There’s weekly homework activities, as well as in-class activities and small group work. The assessments are—there’s a few different types. There’s open-book quizzes four times during the semester, there are three problem-solving projects, as well as a midterm and final exam. So the midterm and final exam, you know, as you can see by the diagram or image here help constitute 50%, and then the problem-solving projects and the quizzes are each 25, to make up a whole of 100%. 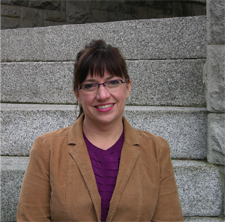 MICHELLE BENSON-YOUNG: So timing and scheduling, once again we have class Tuesdays and Thursdays, 8:00 to 10:15. There is homework due on Thursdays and there’s homework feedback on Tuesdays. There are also in-class assignments that are due by the end of class. Now I realize this is an early class, so make sure that Monday and Wednesday nights are good nights for you. [laughs] Stay hydrated, math is fun. We’re also going to have quizzes, these are the dates of the quizzes so you can plan in advance, the dates of the projects, and then of course we have our midterm and final. Check the learning guide for details on how that’s going to look. MICHELLE BENSON-YOUNG: And last but not least, student expectations and responsibilities. Come to every class! Be on time, and be present; meaning, have your coffee and your breakfast. You’re welcome to bring it with you, but make sure that you’re ready to go. Take advantage of all the course material. I want each one of you to be successful; I want all of your learning styles to be honored and accommodated. And so that is what all the class materials are about. And, then communicate. Make sure that you let me know what’s going on, if there’s something more I can support you with, or if there is something that I need to know to improve myself as a teacher, I would like to hear that too. So thanks again, and welcome! Often accommodations are placed at the end of a syllabus. From a UDL perspective, consider placing information about support systems, including accessibility, at the top of your syllabus. This ensures that students see the supports available and sets the tone that you want them to succeed. This guide is available as an accessible PDF from the course web site. Students with documented disabilities can register with the Disability Support Services office. Please inform me about specific accommodation needs at the start of the course. Students without documented disabilities who may need specific accommodations should contact me to set up a conference to discuss specific needs. Highlight the goal(s) of the course and include a note from the instructor about why the course material is relevant to students. This course introduces selected algebraic topics with an in-depth application of graphing and mathematical reasoning. The goal of this course is to give you the algebraic foundation necessary to continue in mathematics courses. The material in this syllabus is important to ensure your success in this course. State in your syllabus that objectives will be connected directly to assignments each week to increase understanding of the purpose. These can be outlined further in a separate learning guide or on the course web site. Break up objectives by topic to help students see the structure of course material. You could also include a graphic organizer to display how the objectives relate to each other. Include an objective that asks students to identify features of UDL within the course to increase awareness of their own learning preferences. The following objectives will be connected directly to the assignments on a weekly basis to increase your awareness of the purpose and intention behind assignments. I understand and can use a variety of techniques and properties. I can use techniques and properties to solve specific types of equations and change the form of expressions. I can use characteristics of several families of functions and can use multiple representations of functions to answer real life questions. I can use mathematical notation and vocabulary to communicate correctly and concisely and understand these in a meaningful way. I can identify multiple ways in which the material has been represented, multiple ways in which I have expressed my understanding of the material, and specific activities and assessments that have been most engaging to me as a learner. Include a variety of materials, beyond printed text, to increase the options of representation and increase engagement. Invite students to contribute to the collection of the materials to increase ownership of the course. Be sure that any materials included in the course are accessible to all learners, including links to outside resources and tools. If you need an accessible version of this text, please contact the Disability Support Services office. All students must log onto the course web site several times each week. Here you will be able to engage in online discussions with classmates, submit assignments, and view your grades and progress. This is a collection of hand-outs that are related to course material and study guides. Accessible slide presentations will be posted on the course web site and will be used to highlight critical lessons for the week. On the course web site there is a collection of YouTube videos, instructor-created videos, audio recordings of interviews of people in the field, and other related material. This collection of web sites (many found by former students) feature real-world applications of algebra and other math concepts. Some of the best materials come from students. Send the instructor any blogs, web site URLs, books, videos, etc., that might be of value to this course and your classmates. Provide assignments and assessments that provide choices for physical actions, expression and communication, and executive functions. In planning assignments and assessments, consider possible barriers and construct irrelevant factors. For a more detailed description about assessment see the UDL and Assessments page. Assignments include weekly homework activities and in-class activities, including small group work. Details of assignments will be provided on a weekly basis. Open book quizzes will be given four times during the semester and will add up to 25% of your overall grade. There will be three problem-solving projects. You have the choice of video recording yourself or writing a paper with the solution and an explanation of your thought process. These will account for 25% of your grade. The midterm and final exam will be a two-hour test with scheduled breaks to work on non-test items collaboratively with the instructor as a way to get “unstuck” while working on test items. These will be 50% of your grade (25% each). 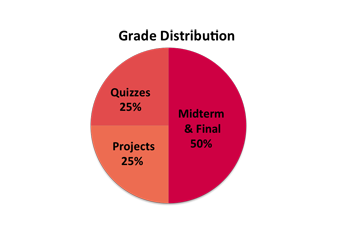 Pie chart showing grade distribution: quizzes are 25%, projects are 25%, midterm and final exams combined are 50%. Dependable routines and expectations within the course help students plan and prioritize. Establish a schedule that explicitly states when assignments are routinely due and when students can expect to get feedback. A syllabus may be the best place to address the general routine and cover any additional communications such as the week-by-week content topics, the material to be covered and how the assignments connect to the course objectives. Tuesday: Class 8:00 a.m.–10:15 a.m.
Thursday: Class 8:00 a.m.–10:15 a.m. Details of each week, including the dates when specific course content will be covered and how the content connects to the course objectives, are included in the learning guide for each week and are posted on the course web site. You can also view the course calendar on the web site to see the full schedule of content and due dates. Explain in detail expectations for learners at the beginning of the course and frequently throughout different points in the course. 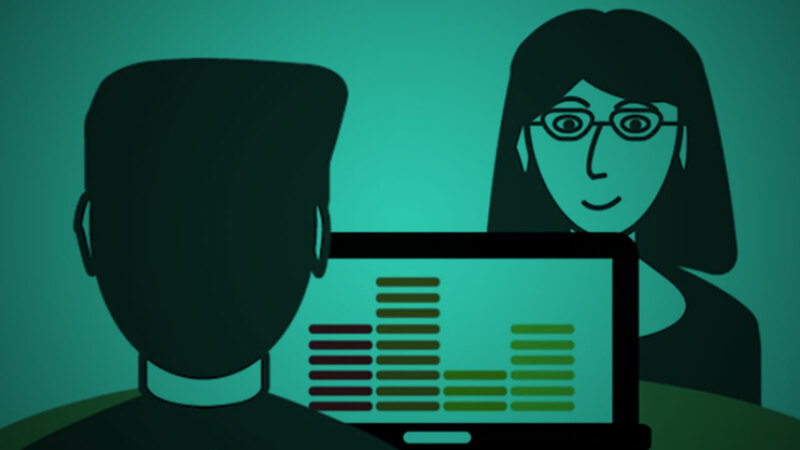 In your introduction video, include an overview of your expectations and their responsibilities. Come to every class. Be on time and be present. The beginning of class is a great time to review previous material and build new concepts. Being present means being an active student. Take notes, try problems, write down questions, and ask them when you don’t quite get it. Your goal during class should be to think actively and make connections so that the concepts make sense to you. My goal is to help you make these connections. Take advantage of all the course materials. Read the textbook, but also use it to test your knowledge by practicing the author’s problem sets. Think about homework as a practice tool, not just an assignment to complete. Write down your process so that you can see where errors occurred and refer to it as a guide for future assignments. Use office hours, email, Skype, Twitter to communicate with your classmates and me. Don’t wait until you’re struggling with a problem. Address any issues well before assignments are due and assessments take place. Reach out when you need help developing a strategy either for a problem or for managing the course. I will ask you throughout the course what is going well and what needs improvement. A syllabus is an outline of the key parts of a course and includes important information about policies, dates, assignments, and assessments. Accommodations are adaptations provided in the classroom or on an assessment to qualifying students that do not fundamentally alter the skill that is being taught in the classroom or measured on the assessment. A graphic organizer is a visual representation of textual information and ideas. Concept maps, story maps, advance organizers, story webs, semantic maps, and cognitive organizers are all commonly used types of graphic organizers. Audio, in this context, is a digital form or representation of sound. It is a format that stores, copies, and produces sound according to the data in its file(s). Construct irrelevance is the extent to which test scores are influenced by factors (e.g., mode of presentation or response) that are not related to the construct (the concept or the characteristics) that the test is intended to measure.